The following is a further posting in a series of articles by David French, a patent attorney with 35 years experience, which will review patents of interest and other matters touching on the field of Cold Fusion. 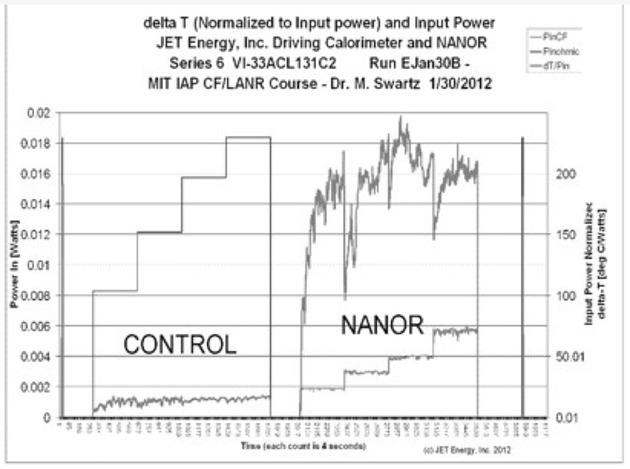 This is a report of the technology presented at ICCF-17 but released in the spring of 2012 following demonstrations held at MIT over January 30-31, 2012. I personally attended those demonstrations and can confirm that the graphic outputs referenced below and in the ICCF-17 presentation of Dr Peter Hagelstein were in fact generated on that occasion. This may be the technology that demonstrates Cold Fusion in a way that can be observed by anyone around the world. The year 2013 will be the year in which the dam of disbelief respecting the Fleischmann & Pons phenomena will finally break. This will start with the recent successful showing of the film “The Believers” in Chicago on October 16 and its follow-up presentations. The press will gradually notice the issue. Enough courageous journalists will demand from their editors page-space to expose the shabby treatment of this phenomenon that has occurred over the past 22 years. Sufficient demonstrations of unexplained excess energy have been repeated in laboratories around the world to shatter the paradigm that Cold Fusion is a pathological science. The result will be a demand for experiments that can be reliably duplicated by persons, agencies, laboratories and businesses around the world interested in re-examining this New Energy Effect.